Bones, spikes, dark colors...very nicely done. As you can see as an orc, covering up is important. 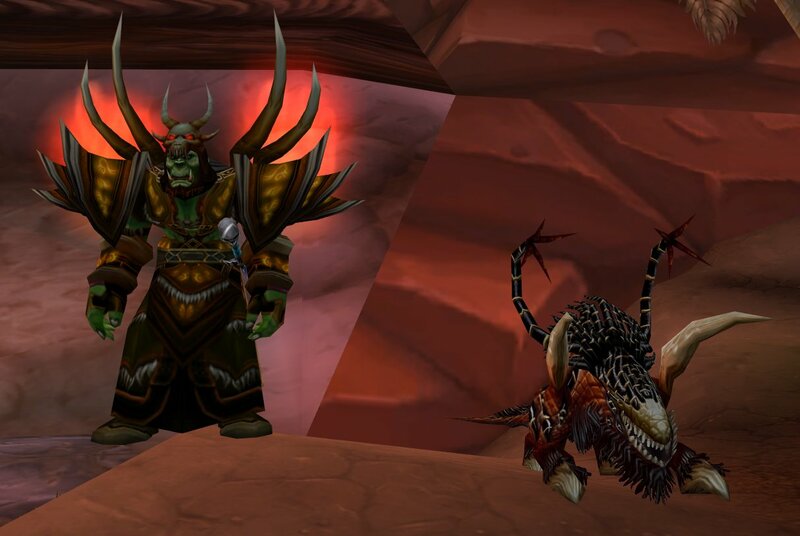 The helm hides most of his face and the dark, foreboding colors look great with his felpuppy. Simple but effective in creating an imposing presence. 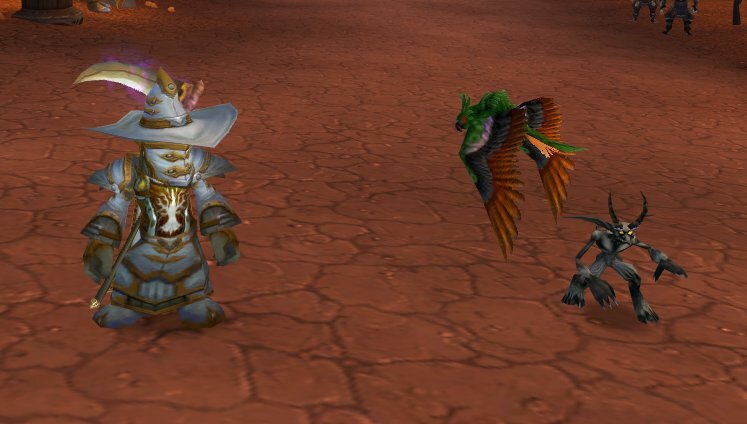 The next picture is of a goblin warlock who is Tmogging a simple PvP set. While the entire matching set looks great and the scythe is a nice touch to complete it, the colors do nothing for the “creepy” factor. On a belf or human they could maybe pull this look off but as a goblin they kind of resemble a circus clown. Am I wrong in this thinking? I sure hope not. This same set has the darker purple variation with a mix of dark browns. Probably a better choice. Our next picture has a very unique set and I”m very excited about her creativity. She said her mix and match outfit came from drops in AQ40 and some mixed items she picked up from the Mogit addon. I really like the look on her toon but you be the judge. When viewed together these individual pieces look like a real dungeon set. Great job! The last picture I have to post to once again point out an important warlock rule. 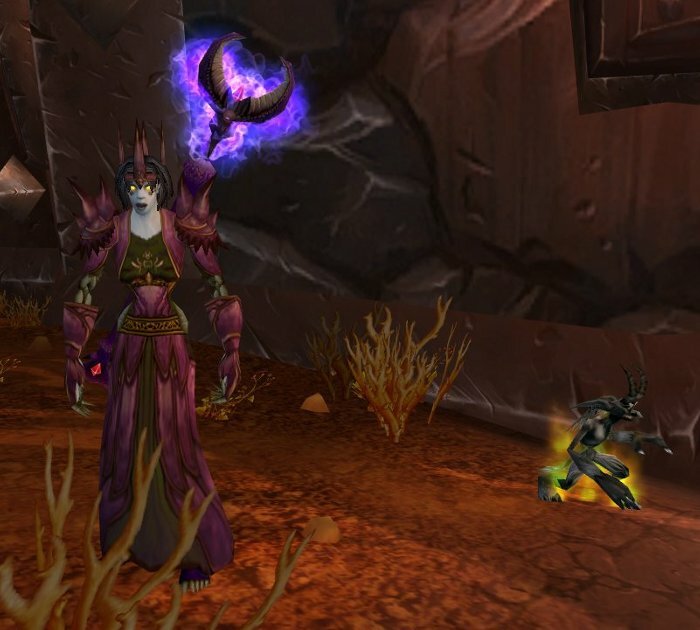 While this famle Belf warlock didn’t look bad in her Tmog she was however doing our class a great injustice. She was Mailbox dancing! This is a H U G E NO NO NO NO NO! 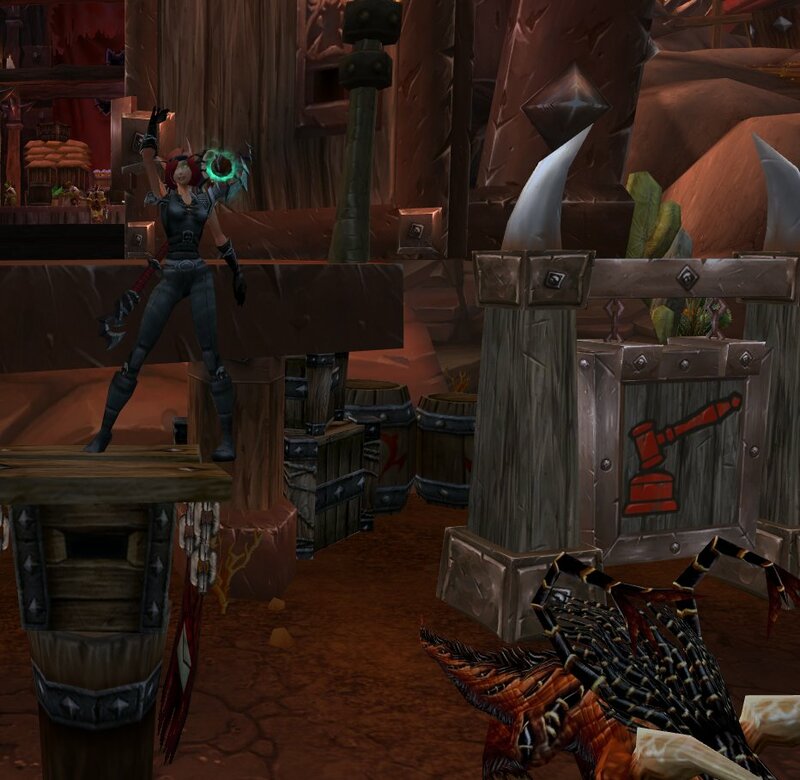 To make matters worse was you could see the big “AFK” above her head and she remained dancing in front of the AH for about 20 mins until either she logged off due to inactivity or out of embarassment. If you see a warlock doing this please shame them publicly as if they were a mage and you would be justified in your actions. I think the goblin looks like a priest! Maybe that’s effect he’s going for, class confusion based on appearance?! I am working on my Disc Priest set to look more like the last lock (more like a rogue). Make sure to send me a pic of the “white” set your working on… Always nice to see some good warlock Tmog and steal…er…I mean borrow from another’s ideas!